Arron Villaflor on breakup with Jane de Leon: "For me naman, it was a good relationship. It's just that there are things to be fixed. Hindi kami mag-jive in so many ways because I'm older than her... Siguro hanggang dun na lang talaga. You just have to accept that." 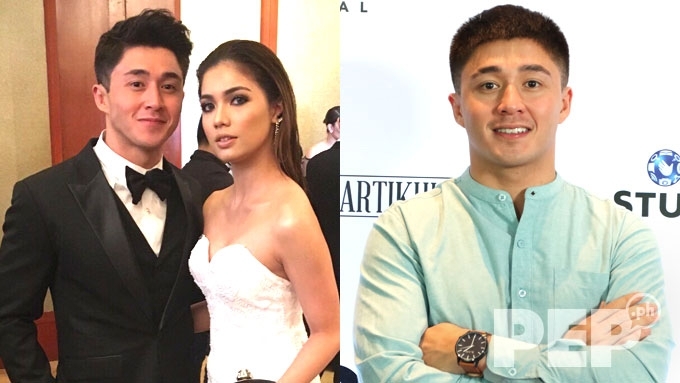 Arron Villaflor admitted that he and former GirlTrends member Jane de Leon have broken up after a year of being in a relationship. The Kapamilya actor refrained from mentioning the name of his girlfriend during the interview, but he and Jane confirmed in previous interviews that they are exclusively dating since last year. Speaking to PEP.ph (Philippine Entertainment Portal), Arron revealed, “I’ve been sad lately because of my love life. Almost a month na rin. “Wala, e. Sobrang may mga bagay na hindi kami magkaintindihan." Did a third party cause their breakup? Or was it a case of one of them falling out of love? Arron replied, "Wala namang ganun. Wala namang third party." He went on to say that their age gap may have been a factor in the way they dealt with their love troubles. The 28-year-old actor said, “For me naman, it was a good relationship. It’s just that there are things to be fixed. “Hindi kami mag-jive in so many ways because I’m older than her. She’s 20 years old. “Hindi naman ako nagkulang to give advice when it comes to work here in the industry, on how to deal with people, on how to talk to them. “Siguro hanggang dun na lang talaga. You just have to accept that." PEP.ph had an exclusive interview with Arron at the digital conference for the movie Goyo: Ang Batang Heneral, held at Cinema 76 in San Juan City last night, August 28. Although he’s sad about their breakup, Arron said that he understands that Jane needs the “freedom” to grow on her own. Talking about how only time can tell if there’s a chance for them to get back together, Arron added, smiling, “Oo nga, e. Totoo ang kasabihan, kung kayo, kayo talaga. “So right now, I’m still healing my heart. Arron also keeps himself busy with doing promo rounds for Goyo: Ang Batang Heneral as well as the 2018 Cinema One Originals entry Mamu. “Feeling ko yung kapalit trabaho!” he remarked with a laugh. “Minsan ganun, e. Hindi natin makuha nang sabay yung puso tsaka trabaho. Minsan hindi agad ibibigay sa atin.